I have never been the best when it comes to keeping track of my money. I would get paid, it would get spent. Easy come, easy go. I didn't think twice about it. This mindset all changed once I became a Mum. I realised it's time to be smarter with our finances as now it's not just us two, we have a baby to provide for. Both my partner and I work, fulltime and part but I am currently on maternity leave. I am nearing the end of my paid leave now so we are going to have a tough couple of months and are going to really have to cut back. Like all families we have money coming in but a lot of expenses going out. Not only will we be bringing in less money once my pay ends but we have just bought our first home. Mortgages are pricey but we have a full house renovation to pay for on top of that. Believe me when I say it's extremely expensive! If that's not enough I would also like to start saving up again as all our savings where spent on our house deposit when we bought the house. It's feels good to have a little bit of money tucked away incase the car breaks down or you decide to book a last minute family holiday. You just feel so much more secure knowing you have a bit of spare money there if you need it. Saving for our future is one of our main priorities. As you can see we have a lot to pay for and save for. Knowing we are rather careless when it comes to spending and saving I find it really stressful and daunting when I attempt to think "money". It's also really frustrating knowing we should be managing our money a lot better but just don't know how. I wouldn't of known where to begin. This is where Money Dashboard comes in. Did you know that you can manage your money online simply by signing up to this free and invaluable service? Money Dashboard is a personalised programme that shows you your finances and tells you exactly where your money is going on every online financial account that you have. All your online accounts are linked and they usually refresh every day. Your finances are then displayed on your dashboard which allows you to keep track and manage your finance at a glance. Not only does Money Dashboard track where your money is going but it breaks it down into categories such as household, leisure, petrol. It even shows you how much you spend in different shops which is perfect if you are a shopaholic who needs a wake up call! It even breaks down your expenditures into an array of different visual graphs. My personal favourite being the colour coded pie chart!. Impressively it doesn't stop there. Their online budget planner tells you what you can spend each month and what will be left over to save. Whether you want to save up for that new car or pay off a store card the budget planner will help you reach your goals and teach you to be a savvy saver too. I can't tell you how much Money Dashboard us going to help my family and I. I can now spend and save all whilst keeping a close eye on my finances. It's easy to use and understand and has made me feel more confident and in control when it comes to our money. I wish I had of discovered it sooner as I now feel a weight has been lifted from my shoulders. 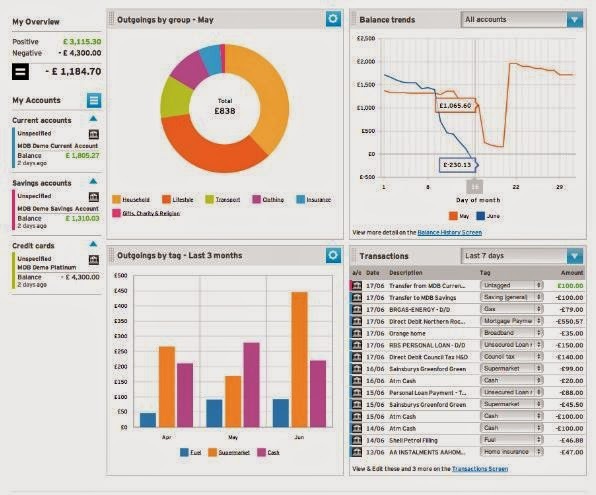 Long gone are the days of sums, calculators and stress, I can put all of my trust into Money Dashboard! I might go and check this out - I am shocking with money! !